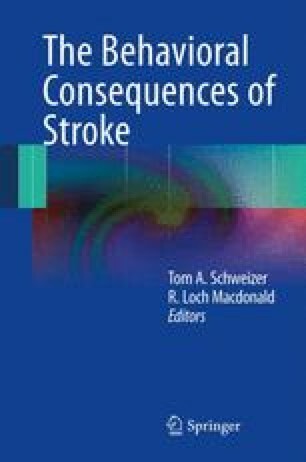 Stroke is defined by the World Health Organization (WHO) as “rapidly developing clinical signs of focal (or global) disturbance of cerebral function, with symptoms lasting 24 h or longer or leading to death, with no apparent cause other than that of vascular origin” . Therefore, stroke may be the result of an ischemic or hemorrhagic etiology. In either case there is a “core” area of immediate cell death related to the primary insult surrounded by a zone of viable but at-risk tissue. In the case of ischemic stroke the core is defined as a severely hypoperfused region with blood flow estimated to be less than 8 mL/100 g tissue/min . The core is surrounded by a zone of tissue that suffers from critically low blood flow estimated to be between 8 and 20 mL/100 g tissue/min known as the “penumbra.” With continued ischemia the penumbra goes on to die . In the case of hemorrhagic stroke, the core area comprises tissue that is destroyed immediately by shear force and mass effect relating to the hemorrhage . The surrounding tissue probably does not have impaired blood flow as in ischemic stroke , but is at risk of further damage if the hematoma expands or re-bleeds and creates further shear force or mass effect .